This is the only close up photograph I have of Sam. 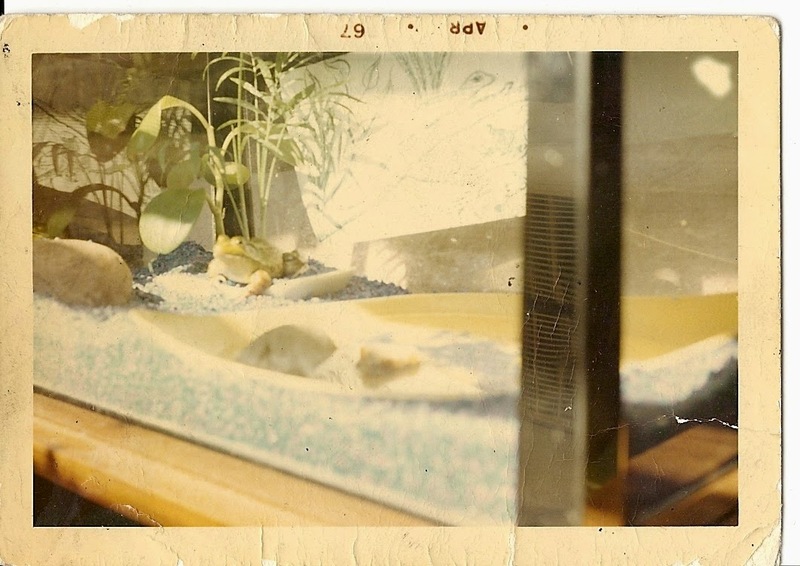 He was my frog from July of 1966 until his untimely death due to a fungus sometime late in the summer of 1967. Sometimes I think he just didn't take to life in the city. I have some other photos of me holding him in a coffee jar right after his capture. I look so happy with my new acquisition, with no thought of the poor frog, who must have been very upset with the jar and the smell. I can still remember that it was a Maxwell House jar. I used to get water for him from Prospect Park on the weekends and fed him live meal worms which he seemed to be very fond of. He also liked raw chop meat, to which I would add his liquid vitamins. And when he eventually got sick I took him to the Animal Medical Center in Manhattan. It still makes me laugh to think about filling out the form for the intake process. I was alone, having taken the subway with Sam. They asked questions that simply did not apply to my particular pet, but the one Sam and I had the most fun with was when they asked for his color and I wrote "green." Man, we had our fun, Sam and I. After a bit of initial confusion we were ushered into a Veterinarian's office overlooking the East River below the 59th Street "Feeling Groovy" Bridge. The vet came in and took a look at the two of us and wondered, almost aloud, if this was some kind of joke being played on him by his fellow vets. I assured him that we were in earnest, Sam having been sick for several weeks at this point. I had tried every homeopathic remedy known to reptiles and humans alike, all to no avail. The vet gave him an injection which he claimed would either help him or not. I paid the $8 and left. Sam never made it home alive. The next day I rode my bicycle to the Old Mill on Avenue U in Brooklyn, and set him adrift in a fur lined cigar box hoping that the tide would carry him away. Kind of like a Viking funeral without the flames. There's no moral here; no trauma involved. It’s just me going through my photos and memories; still looking for clues to who I was and where I've been. I’ll keep you posted.